Billy is a UK based artist who does detailed drawings related to dancing and motorcycles… strange combination. 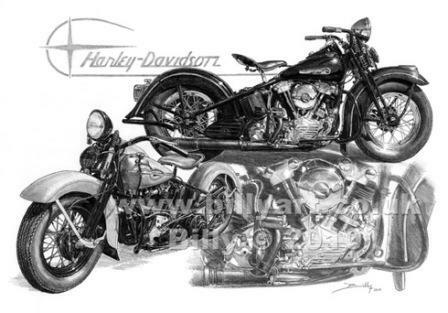 Of interest to us is the limited edition print of a pair of Harley-Davidson Knuckleheads. It takes Billy an hour to draw one inch of detail. The print is of a 1946 and a 1947 Harley Knucklehead and is titled ‘A Pair of Knuckleheads’. Each of the 250 limited edition 16″ x 12″ prints are $35 including free shipping from England. Billy will give away the original pencil art worth $1600 to one of the print buyers when the edition sells out. I think I’m going to buy one just to get a chance at winning the orginal. 1 out of 250 is a pretty good chance of winning this valuable artwork.